Dive Computer Maintenance!!! / Battery = Battery ? We have received over the last four weeks numerous dive computers of different brands with the unpopular “ERR” Display Reading. Most customer complaints were “Computer eats Batteries” – or high power consumption in technical terms. PACIFICA tests all computers for power consumption and accuracy before returning the unit back to the customer. We have our own UWATEC Pressure chamber so don’t be surprised when the log shows a 150ft dive with deco stop after the service. After removing the wrist straps and the old batteries the testing started. The units were tested for power consumption which in rare cases can drain the batteries and needs internal fixing. Two units were identified with abnormal high consumption. None needed a PCB repair. In both cases salt & mineral build-up on the wet contacts (see picture) were responsible for draining the power within days. The owners would have saved a lot of headache and some batteries by proper rinsing and cleaning the computer after diving. Of the eight remaining computers one was fitted with the wrong size/type battery, explaining the malfunction. The remaining seven units all came with the same brand of battery. I don’t really want to mention which brand it is as I think that all are fakes and not the original branded. All were CR2450 and were supplied by the same source. So if your computer runs out of battery much faster than acceptable it might need some attention and a brand new, genuine or branded power-source. This entry was posted in Uncategorized on August 9, 2010 by pacificadive. This entry was posted in Uncategorized on August 6, 2010 by pacificadive. Since Johnson Outdoors acquired Seemann Sub in 2007 many things happened. 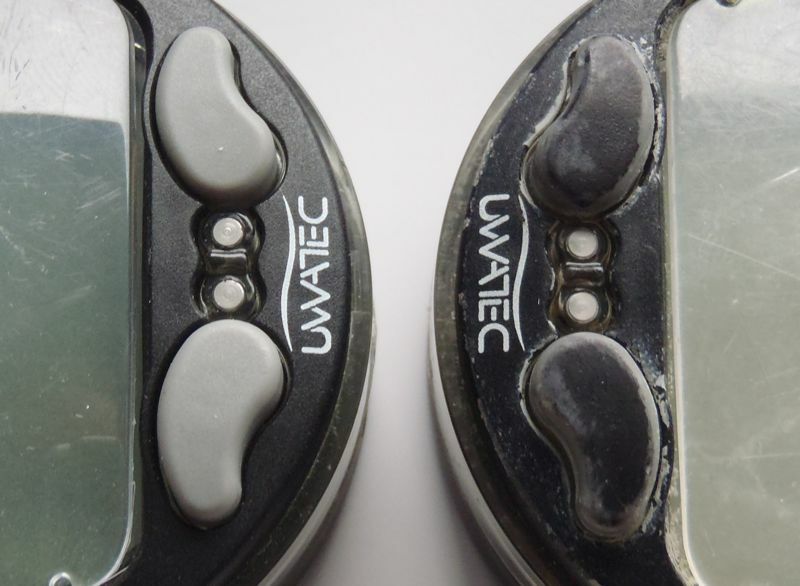 Johnson Outdoors evaluated the Product Portfolio and is upgrading many Products with the Knowhow of it’s SCUBAPRO and UWATEC business. 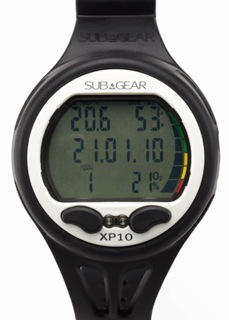 One example is the XP10 Dive Computer of SUBGEAR. Many will recognize it’s face and interface even after the face-lift. Over are the times that entry level computer had to make due with Air-Only mode and absence of IR PC Interface and other features. 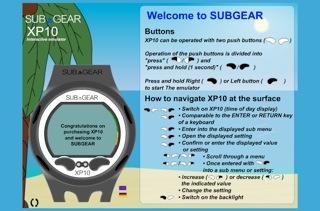 Under the “hood” of the new XP10 works the proven electronic and feature kit of the UWATEC Aladin Prime. With NITROX capability up to 50%, user replaceable battery and build in IR-Interface it offers the full package at a price of ony 22,900PHP. This entry was posted in Uncategorized on August 3, 2010 by pacificadive. PACIFICA offers Stickers from FUN FRUITS to SERIOUS VOODOO Gas. We also offer customized vinyl stickers up to 28″ in width on various different materials like clear, white, colored, metallic and other substrates. Name it, we make it! Recently STEFAN WIESSMEYER Jewelery released it’s catalogue online. 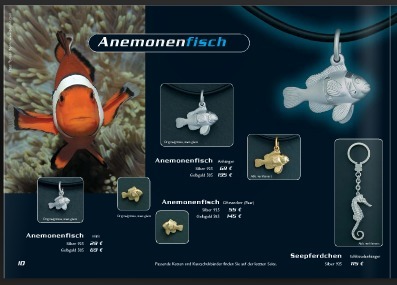 It’s not just that Stefan produces many handcrafted marine motive jewelry for HER. They also featured Torben’s shot of a Clownfish on page 10! The picture was taken in Mantangale Resort, Mindanao. Check also out the pieces incorporating marine fossils!